Having some idea of where you're going and where you've been can be pretty important, especially when you are out in the middle of nowhere. We are in an amazing age of technology where anyone with a phone or tablet can download an app of some kind to track their whereabouts on a map. We've regularly jumped from app to app for the past 3-4 years, trying to find something that covers our needs. Between the different phones, apps, stereo and tablet, at times this has caused some confusion recording, downloading and finding previous trip data. However we're happy to say we have finally settled on one system...for now. We originally starting with an app called Oruxmaps and some maps downloaded from Openandromaps, based off open street maps data. These were fantastic for trips close to home, however the details in more remote areas is lacking and it isn't always clear if tracks are hiking, bike or 4wd accessible. In a quest to find more detailed maps for our trip to the Kimberley we purchased the Hema Explorer App at the beginning of 2016. Hema also use data from Here Maps which covers our needs when 4wding closer to home and uses their own well regarded map data for more remote travel. Since moving to Hema we've been thoroughly impressed by how easy the platform is to use and it's now our go to app when we hit the trails. Any tracks or waypoints saved while out exploring are synced back to the Hema Cloud once we are connected to the internet. From any computer we can access the Hema Explorer website to plan trips, make waypoints and view anything synced from my tablet. About the only issues we have had with the whole system is that you are limited to the maps provided, there is an ongoing subscription fee to get extra maps on top of the purchase fee (we aren't using this service) and previously the website was quite slow to scroll and zoom through maps, however this seems to have been rectified recently. We originally started running apps on my Samsung Galaxy S3 phone, this was updated to a Galaxy S5 however I found the screen to small at times. I installed a new stereo in the Paj, a Parrot Asteroid Smart unit that runs Android and transitioned to using it with it's larger screen. This was my main navigation system till last year moving to a Samsung tablet, mainly because the stereo was a pain to get data off and on and it runs an oooooold version of Android so it meant we were unable to run the Hema Explorer App. The tablet again has a larger screen which is fantastic! 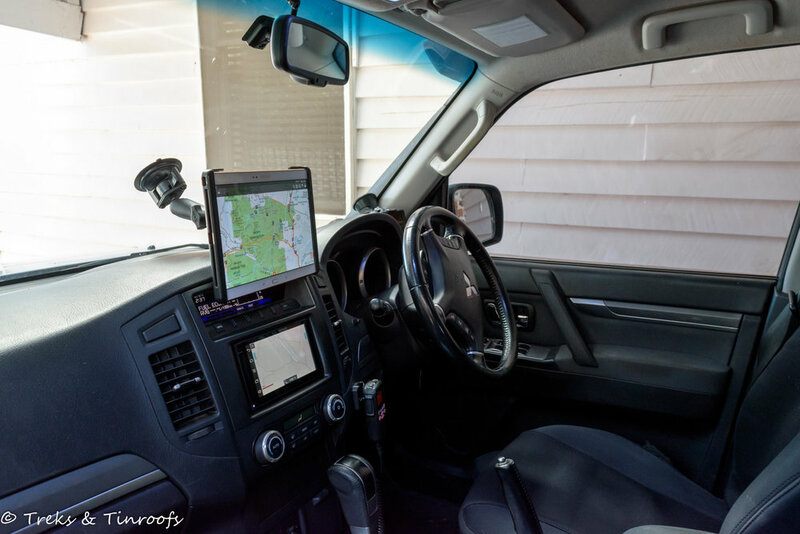 We mount the tablet to the windscreen with a Ram-mount suction mount. Communications can be key to safe travels in convoy or traversing a tricky section of track, even to just having a conversation between cars on the road can help pass the time. 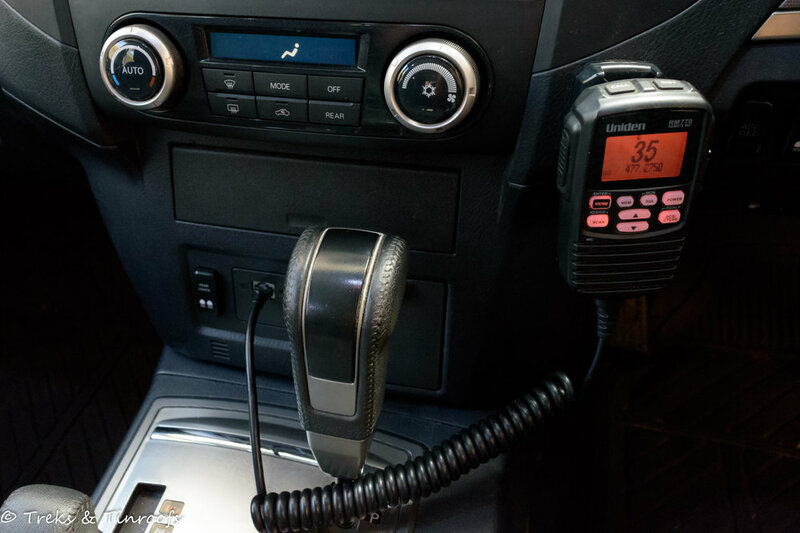 We have fitted a remote head UHF unit in the car allowing the control box to be hidden up behind the dash and only plug in the mic, which contains the controls for the UHF, when needed. Radio waves come in and go out through an antenna mounted to the bull bar. While this has served us well the antenna struggles over longer distances, UHF is really only for close range communications so for any remote travel we would be looking into satellite technology. We also have a pair of handheld UHF's which are within arms reach from the drivers or passengers seat. These are perfect for jumping out and guiding the driver through difficult sections of track, or if another vehicle in convoy hasn't got a radio. Tablet – Samsung Tab S 10.5"